Leah Marikkar Bazalgette, Executive Director at Dentsu Aegis Network SL (DAN), has been nominated as a member of ‘The NEW and Social Influences’ jury at the global renowned 2018 London International Awards (LIA). The event is a global annual festival honouring creativity and new ideas across multiple mediums, and will take place at Encore Las Vegas from 29 September through 7 October. The London International Awards was founded in 1986 by President Barbara Levy and was the first truly international accolade to honour creative excellence in the realms of Cinema, Television, Print and Radio. Since then it has grown to honour 22 unique media assets, some of them being; Ambient, Branded Entertainment, Design, Digital, Health and Wellness, Integration, Medical – Craft, Music and Sound Production and Post-Production, Social Influencers and Verbal Identity. Each year, LIA gathers the best creative minds in the business across global borders to judge all entries and the juries comprise of the most talented, recognised and awarded representatives from within their respective fields. Leah will serve on this jury panel headed by Jury President Susan Credle, Global Chief Creative Officer of FCB, USA, which includes names like Adrian Bosich, Managing Partner/ Creative Founder of AIRBAG, Melbourne; Donald Chesnut, Global Chief Experience Officer of Publicis.Sapient, New York; Jayanta Jenkins, Global Group Creative Director of Twitter, San Francisco; and Menno Kluin, Chief Creative Officer of 360i, New York among others on the Jury. Leah will join the diverse international panel, comprising the most talented, recognised and awarded individuals. The panel will acknowledge advertising ideas that highlight new roles for brands and agencies, based on emerging media technologies or actions and brand experiences or ideas and supply chains in terms of being an influencer. Some prominent industry names Leah will be in the company of and exchange knowledge are; Executive Chairman/Global Chief Creative Officer of Leo Burnett Worldwide, Mark Tutssel; Head of Partnerships at Red Bull Media House, North America, Perry Fair; Chief Creative Officer/Partner of Mother, Corinna Falusi and Global Head of Creative, YouTube Originals LA, James Spence. 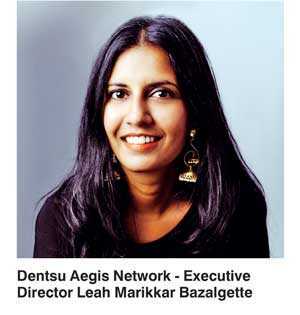 Leah leads a dynamic young team at Dentsu Aegis Network (DAN) Sri Lanka and believes in inspiring them and pushing the boundaries when it comes to creative work emphasising the need to look for solutions for brands from a media neutral perspective. Her extensive knowledge and integrated experience globally has enabled the agency to form exceptionally strong client partnerships, creating innovative campaigns in recent times. She began her career in TV production at Young Asia TV at the age of 15-year-old and soon grew to become a Producer, Writer, Director and Presenter. After moving to England for her degree in Broadcast Journalism, she interned at CNN and later became a Political and Military Correspondent for the Associated Press in Sri Lanka. Leah returned to London where she worked for some of the top experiential agencies producing integrated campaigns for global clients such as MTV Europe Music Awards, Esprit, Honda Dream Factory, Redbull, GAP, Virgin Trains, Google and the British Fashion Council. Commenting further on the context of advertising today, Leah adds, “Advertising was about creating icons and identities for brands, logos drawn and shared on napkins. But no longer. It now entirely relies on empowering audiences, on facilitating and encouraging independent decision making and celebrating individuality. Successful campaigns force you to question yourself and drive discovery, brands must have purpose that live beyond their obvious core remit. We are challenged now more than ever before to create genuine moments to engage people to notice us, so authenticity and transparency are critical traits that creatives must champion when creating campaigns. Prior to taking up her new role at DAN, Leah worked for world-renowned Harvey Goldsmith and his creative agency, Ignite, producing large scale events and creative strategies for global brands such as Barclaycard and NFL. She has also worked for large scale music festivals such as Glastonbury, Latitude, Reading and Leeds Festivals in the UK. Leah is the Co-Founder and Director of Sri Lanka’s first international live music festival, the Electric Peacock Festival bringing Grammy Award Winning artists such as Roger Sanchez, Tinie Tempah, Basement Jaxx and Mark Ronson to Sri Lanka’s shores since 2010.